I'm indebted to Deb Robson for two very special reasons. First, she introduced me to the music of Playing For Change. I've been to two of their concerts and bought the CDs and DVDs. Playing For Change is now a favorite and I hope to be seeing them again before long. You can see more about the group if you check out my blog post of October 13th. 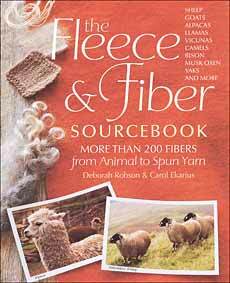 Now, I'm reading the book, The Fleece and Fiber Sourcebook that she wrote with Carol Ekarius. I followed Deb's blog and Tweets, reading about all the testing of the various fibers. It sounded like a great deal of work. Now, in my hands, I have the result of that hard work and I'm totally blown away. I'm not a spinner and I know very little about where my yarn comes from. I get my yarn in a store all nicely prepared and labelled, ready for knitting. I know that merino yarn is soft, that qiviut comes from the muskox and some of it's fabulous qualities. However, now I'm learning so much more. I've never seen a book quite like this one. I'd say that this book is a textbook, educating the reader about the fibers of animals such as sheep, goats, bison, yaks and so much more. But, textbooks are generally rather dry and boring and this one is definitely not boring. There are loads of pictures of the animal, the fleece in its raw and cleaned state, the yarn and a sample of what it looks like when it's been woven and/or knitted. As a person who likes geography I like the maps inside the front and back covers and that the various animals are sorted into regions. I'd never heard of an ouessant before and now I know where it comes from, what it looks like and about its fleece. I'm enjoying my education. I'm so glad that the ladies wrote this book and that it's now an essential part of my knitting library. This is the go-to book if I want to know about a specific breed. I now have a much better appreciation for the yarns in my stash.